Celebrate National Pet Day with Shutterfly! So first - happy national pet day! Go give your pets an extra hug and a special treat today! Today, I'm excited to share my special way of memorializing my pets. Obviously, I'm huge on photography. Since we got our first little furry pet together in 2008, we've been snapping away photos of the animals in our lives. I'm happy to have so many memories of my pets - from videos of my guinea pigs nomming away on carrots to large prints of Raynor and Teemo above my bed. On St. Patrick's Day, my guinea pig Pichu passed, after nearly 5 years of life with us. I went back through the photos of him that I've dumped onto the internet since 2005, happy that I had the images of him when he could fit into a small glass and was tiny. It really made me realize how important to me it is that I continue to keep these memories of my pets. When Shutterfly contacted me about sharing ways to celebrate National Pet Day with photo memories, I realized I had very few in print of Raynor and Teemo. Sure, I've got loads of photos floating on the web, but not much else. Tons of photos of Jason and I hang around the house, we even have two photo books of our own adventures, but the pups? Nada. If you are interested in actually having a photo session with your dog like I so often seem to do, I have some tips I wrote up back in February you can revisit here. You don't have to have a fancy camera to take these photos either - a lot of my favorites of Raynor and Teemo are taken with a point and shoot camera - and they print just like the ones taken with my large camera! Here's a page of my photobook from Shutterfly with images taken by both my point and shoot and DSLR - can you tell which camera took which photo? Even Instagram or cell phone photos these day can be easily turned into something. These coasters would be perfect as a project to turn your Instagram photos into. You can simply login into your Instagram account with Shutterfly and the images are all ready for you to use! I chose to make a photo book of Teemo and Raynor. Shutterfly makes it incredibly easy to upload your files - even from Facebook or Instagram - and then automatically turn it into a book. I chose the custom path but also to have the photos automatically inserted and organized by date. I changed a few things around, added text, and voila! Photobook while watching a TV show. They have a variety of styles to choose from, and I personally fell for the chalkboard chic story book style. I almost went with the artist's portfolio or the creative type styles, and it took me awhile of playing around to decide which worked best. You can switch styles and layouts easily in the web interface, which is quite simple to use, yet allows you a lot of control. There are a lot of styles of photo books available - hard cover or soft cover, different sizes, etc. I chose a 8.5" x 11" because it fit well between our large wedding album and smaller honeymoon album. I'm personally not a fan of lay flat pages just because I like how pages in books lay - hence the detail of my lovely pages in the photo book. Do you have many printed memories of your pets around the home? Tell me, what would you order from Shutterfly in the comments? Use code SHIP30 to get free shipping on orders over 30 dollars! Products in this post were provided by Shutterfly. This indicates I received a product in exchange for review, although the opinions and ideas expressed are purely my own. For more information - read the disclosure of this blog. To be honest, I had no idea today is national pet day ! Those are awesome ways to use your photos! I put a book together for my parents when our family dog passed away, but I should really keep up on doing books of Casey and Hamilton. Thanks for the great ideas! These books are so cool and look really professional. I definitely need to do this... especially as my dogs age. I don't have many years left with Sam and Madison. omg i had no idea it was national pet day. i'm the worst dog mom ever! oops! but i loooove what you did here. i also have a million photos of the dogs on my phone/camera, but not many in hard copy. i need to do a book like this. i also really love your coasters! would be another great way to have more cute pug faces around our house. This is such a precious way to preserve memories. The coasters are adorable! It reminds me of how this one time in elementary school art, we drew something and sent it into a place and could get it on placemats or coasters or a calendar... so much fun, and it's neat to see this coming back again! Wow,I really need to invest in some photo books! Yours look so nice, and you make a great point about not having tons of photos laying around on the Internet. Thanks! this is such a good idea. I have to start doing this with my photographs. My friend has a 2-year-old and has created a book for each year so far. It's such a good idea...especially creating coasters for the house. So personalized! These are such great ways to remember pets! I don't currently have any, but am hoping to get a dog this summer. The coasters are such a fun idea! 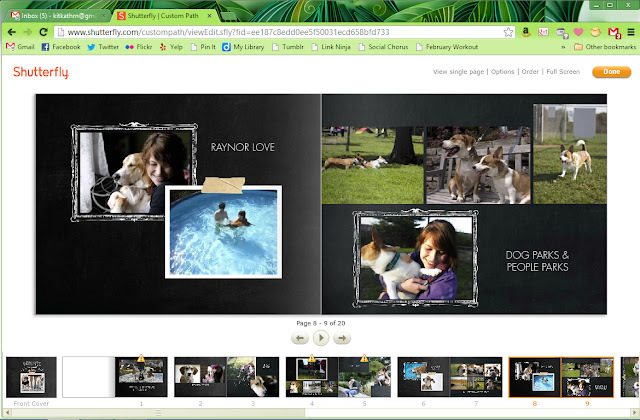 I don't have any pets, but I do love Shutterfly. I've been using it for years! Oooh, I didn't know they make coasters too! That would be perfect for all those IG photos! Very cool idea! I love digital cameras and having everything online but I do miss holding actually pictures and photo albums. I haven't used Shutterfly. I would love a Disney vacation book! I need more printed pics of Mia! I take alot of them but never get around to getting them printed out. Totally love. I have several photo books that I have to work on and one is totally dedicated to little Piri! I love shutterfly! I used the site to make a book for my parents and grandparents about my adventures in europe - very easy interface and pretty cheap! (I made a book with ALL of my weekend adventures - spending 90 days in the netherlands, that's a lot - for only about thirty bucks!) It's a great way to preserve memories! I have so many Shutterfly books and I try to do them once a year (I'm a little behind in getting one processed though. . still need to finish 2012 even). I've been using Shutterfly since 2002!!! LOVE THEM!!!!!!! I love the one book cover you did of Favorite puppy portraits!